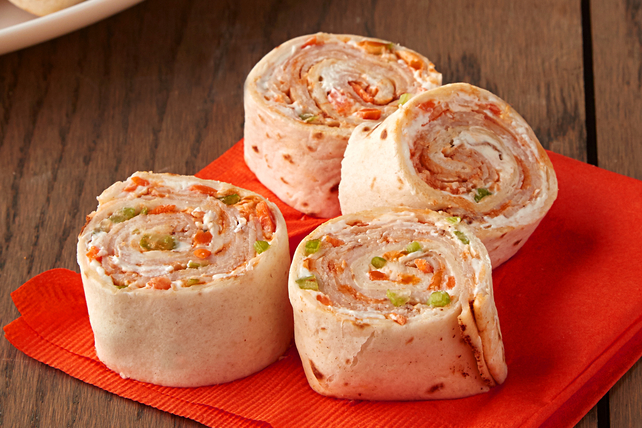 Get the party moving with our Buffalo Chicken Pinwheels recipe. Our Buffalo Chicken Pinwheels can be prepared up to two days ahead of your special event. Spread tortillas with cream cheese product; drizzle with wing sauce. Top with vegetables and chicken; roll up tightly. Cut each roll-up into 6 slices to serve. These delicious wraps can be prepared ahead of time. Wrap individually in plastic wrap, then refrigerate up to 2 days before slicing to serve. Add 1 Tbsp. crumbled blue cheese to the filling before rolling tortillas up and slicing.